Learn how to function in a culturally diverse environment early on. Develop broader skills and the ability to adapt to new environments. Michaela Wentz '17 and Mohammad Almagweshi '18 can testify to that after their study abroad experiences in Dublin and Beijing this year. 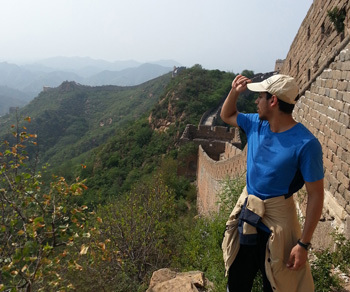 Mohammad is seen at right visiting the Great Wall of China. Courses that have been previously approved are not guaranteed to transfer to the University of Rochester. Hajim students are required to meet with their undergraduate coordinator to review proposed courses before traveling abroad. This is imperative to ensure that credit will be given for each course and that you will fulfill your graduation requirements on time. Meeting with your Undergraduate Coordinator ensures that you have an academically sound schedule for success abroad. An oral assessment may be required for students who take CHE 244 and CHE 225 abroad with the possibility of remediation.